WASHINGTON -- It's not a tweet storm but a real storm. The newest potentially dangerous swirl of hot air is a tropical storm in the Atlantic named Don. And it's a total coincidence that the storm bears a common nickname for the president of the United States. Tropical storms and hurricanes are named several years in advance in a non-political way by an international committee of meteorologists. 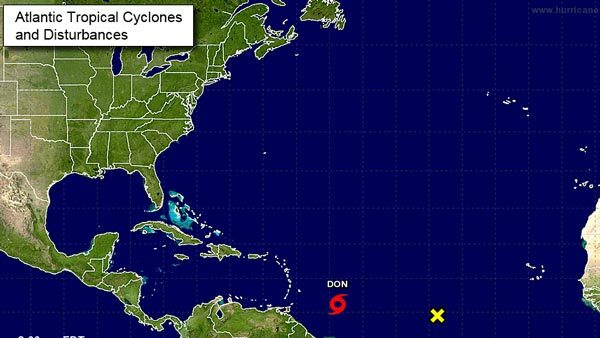 This is the second time there's been a Tropical Storm Don in the Atlantic - 2011's Don fizzled out before it hit land. "I hadn't even thought about that," said Max Mayfield, the former National Hurricane Center director who chaired the committee that added the name Don to the storm list in 2006. "I guarantee you that it has no connection to Donald Trump." The president goes by the full name Donald. The storm is the shortened name, not the longer one. When he was called about the name Don for a storm, Mayfield chuckled and said it wasn't named after any of the meteorologists he knew. He had to be reminded that the president is named Donald. National Hurricane Center spokesman Dennis Feltgen confirmed the name was not a political choice. There's a long established international system to name storms. The World Meteorological Organization, part of the United Nations, has a committee in each storm basin that creates six lists of storm names for each ocean region. They rotate through six years so 2017's storm names are the same as those from 2011 and 2005. They include English, Spanish, French and Dutch names because those are the languages spoken in the storm basin, and they alternate between male and female names. When a storm causes lots of damage, the meteorologists retire that name and come up with a new one to plug in the six-year cycle. In 2005, Hurricane Dennis raked much of the Florida panhandle and was retired along with Katrina, Rita, Stan and Wilma in that record year. Because Dennis was an English male name, the United States got to suggest another English male name. Mayfield said Don, like other names, wasn't chosen about anyone in specific. It is unlikely that Don the storm will be retired. The hurricane center's forecast discussion calls the storm "small," ''not particularly well organized" and likely to dissipate in 72 hours. But storm watches and warnings were issued for Grenada, St. Vincent and the Grenadines and St. Lucia. Hurricanes have had names since 1951, mostly to distinguish different storms. The first two years involved military substitutes for letters, such as Alpha, Baker and Charlie. After two years, the system was switched to female names, and males were added in 1979. Eighty-two storm names have been retired, including last year's Matthew and Otto, with the most starting with the letter "I," as in Irene. When Bill Clinton was president, there was a Hurricane Bill in 1997. In 1992, when George H.W. Bush was president, there were not enough storms to get to Georges, the seventh name on that year's list. The name Georges was retired after 1998, before George W. Bush became president. This year was bound to put storm names under a political microscope. In the eastern Pacific the eighth name on this year's list is "Hilary."